Since 1996 our engraved rocks and stones are the highest rated in the business. Our goal has been to provide engraved stone keepsakes that are of the highest quality available anywhere. Each of our beautiful natural engraved river stones is meticulously hand picked, by us, right from the source. We never buy bulk rocks, like most others do, because bulk stones are simply not good enough to allow us to make the best possible engraved rocks for you; our dearly valued customers. We have many years of experience in natural rock engraving and we have the expertise to make sure that your personalized engraved stone is uniquely beautiful and exceeds your expectations. Please peruse our many online photos to get a good idea of what we do and the fine quality of our custom engraved stones. There is also a large collection of photographs of our stone engraving work on our Facebook page here: www.facebook.com/RockItCreations/photos . If you would be so kind as to like and share our Facebook page with your friends and family, we would appreciate that very much. Using the most beautiful river stones we can find, we use great care and craftsmanship to properly design, typeset, and size, the engraving to your liking. Then, with your approval of the engraving layout, we deeply carve fine quality engraving into every single engraved rock and carved stone that we create. What we do is not easy and the truth is that all engraved rocks are not created equal. Unlike most of the engraved stones out there, whether they are garden stones, pet memorials, or any unique gift, our extraordinary effort and expertise make our engraved stones second to none in quality. 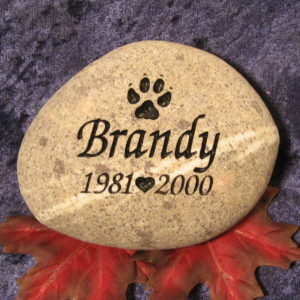 Our personalized stones are truly worthy keepsakes to be perpetually cherished through time. Over the many years of our stone engraving evolution, since 1996, we have created engraved rock art pieces that have completely satisfied many thousands of customers. Our long list of highly valued repeat customers speaks for itself. It is always nice to hear from our many customers that let us know how much they appreciate their one of a kind welcome stones, wedding stones, pet memorials, or other beautiful and unique top quality engraved stone creations that we created just for them. We would be more than happy to create a customized engraved stone gift for you, or for someone special that you care about, that is fitting for any occasion in a most unique and beautiful way. Just let us know what you would like, and where you would like us to send it, and we create a unique engraved stone is sure please even those with the most impeccable taste. If there is any way we can help you with your engraved stone order, please let us know. We respond to all e-mails and phone calls as quickly as possible. Please use our contact page to get in touch with us. Rock-It Creations has been engraving natural stone since 1996. We know what it takes to create fine quality engraved stone keepsakes that are worth holding onto forever. It takes a lot. From time to time, we monitor the pricing of our “competition” and try to keep our prices as low as we can and still survive. We can tell you that with Rock-It Creations, you will get what you pay for: engraved stone keepsakes that are worth holding onto forever. Send a Rock-It Creations gift certificate for an expertly crafted personalized engraved stone to someone you care about and let them know that they are important to you and that you are thinking fondly about them. Gift certificates are a great alternative to giving an actual stone. They allow the recipient more time to ponder so that their beautifully engraved river rock is personalized just right and will be worth holding onto forever. We guarantee that we will always do the very best we can to engrave the most beautiful natural river stones available for you, our valued customers. We will never cut corners and we will strive for perfection in every stone that we expertly hand craft. Stone engraving is an art and all engraved rocks are not created equal! We create one-of-a-kind engraved river stone keepsakes that are worth holding onto forever. We guarantee it!